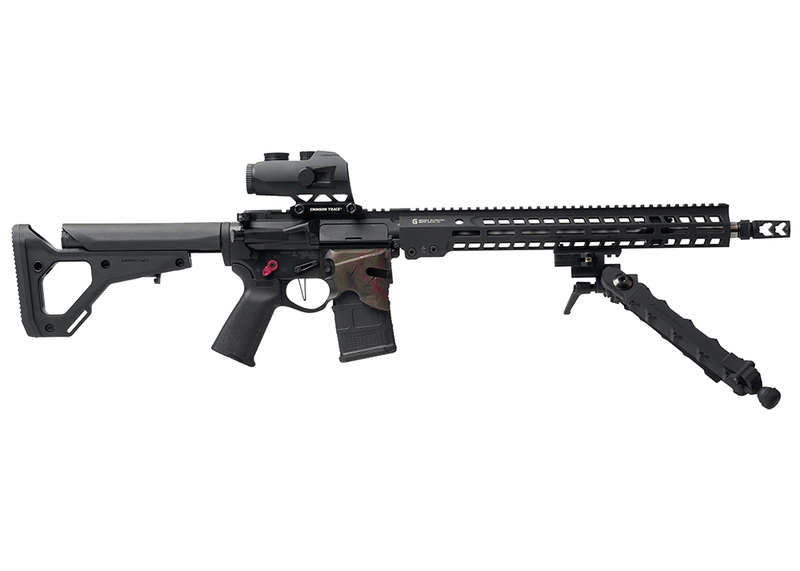 The rifle begins with a Rainier Arms Ultramatch Billet Upper receiver. This particular option has been a top seller on our site for a while. CNC machined from 7075-T6 aluminum and finished with a milspec hardcoat anodize to a surface hardness of 60 Rockwell, these uppers are some of the best in the business. Paired with the Geissele MK14 rail, arguably one of the best rails on the market, this rifle system is built like a tank. Shining through underneath the flat black exterior of the rail system is the Rainier Arms Ultramatch MOD 2 16 inch barrel. This fluted and polished piece is made from the finest blanks available and is a perfect balance between accuracy and weight. Rainier Arms guarantees their barrels and offers a 100% money back guarantee if you aren’t completely satisfied with its performance. On the end of the barrel sits the Fortis 5.56 muzzle brake which aids in maintaining control of the weapon and helps you stay on target for faster follow up shots. The bolt carrier is from Bravo Company USA, which makes some of the finest AR parts in the industry. The charging handle is our new Rainier Arms Avalanche Mod 2 which comes with two different options for handles; either the longer ones shown, or a rounded knurled latch for extra grip. Both can be easily interchanged. The optic is a CTS-1100 by Crimson Trace. This illuminated 3.5x battle sight for rifles and carbines features a fully illuminated BDC (Bullet Drop Compensator) reticle. With a wide field of view, this optic excels in mid to long range engagement distances, elevating your gun’s ability to engage targets in a multitude of environments. It can be installed in seconds by using an integrated M1913 picatinny rail mount and boasts an impressive design that will put up with years of abuse. The final part on the upper is the bipod. Although they add a decent amount of weight to the firearm, bipods can help the shooter stretch their rifle to its full capability, especially with a more mid to long range optic attached. Fitted here is the Accu-Tac LR10 Gen 2 bipod. The LR-10 was designed, engineered, and manufactured in the USA. Made from the highest quality aircraft aluminum available and 100% billet. It's wide stance and ratcheted leg extension gives you the adjustability needed for precision aim and repeatability. The bipod can be canted and locked in place using the throw lever and has a longer extension height with a total of 10 notches. Moving down the rifle, the lower is a Rainier Arms Overthrow receiver cerakoted by Blowndeadline. Machined from 7075-T6 aluminum and a hard coat anodize Black finish, this lower is top notch. Plus, for those of you who are fans of the movie 300, the beautiful paint job of the helmet will give this rifle a special sort of flare that sets it apart from other builds. Internally the rifle sports a Elftmann match trigger which can be adjusted from 4lbs to 2 1/2lbs without removing it from the lower. This is a perfect addition for mid to long range when consistent trigger pulls are key to accuracy. The KNS anti rotational pins keep the trigger in place, using anti creep retainers, that negate the issue of movement in the trigger housing over extended use. Externally, the lower is finished out with a Magpul UBR Gen 2 collapsible stock, Rainier Arms 45 Degree Ambidextrous Safety Selector and the V-Seven ultra-light S7 bolt catch. 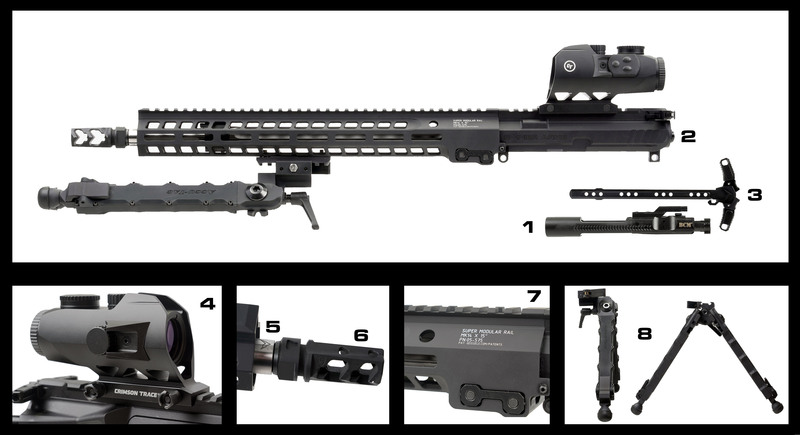 All of these parts combined make this a very durable, high quality rifle that will also set itself apart from the pack. 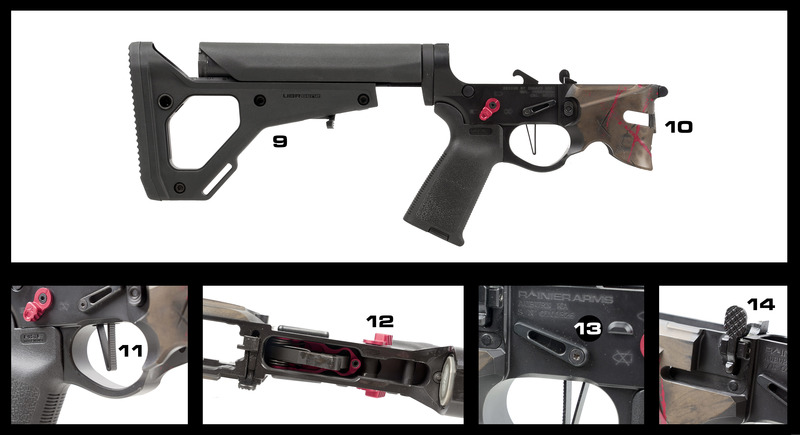 There are so many combinations of rifles and parts out in the world, it can sometimes be hard to create something that is truly unique to you. 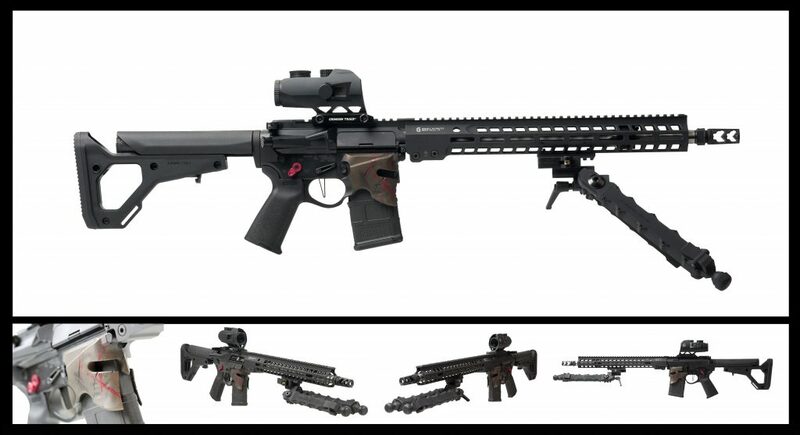 As we’ve said many times before, these ARs are just a glimpse into what you can build. Whether or not you want to run something like this or do something entirely different, everyone has a certain way they like doing things.